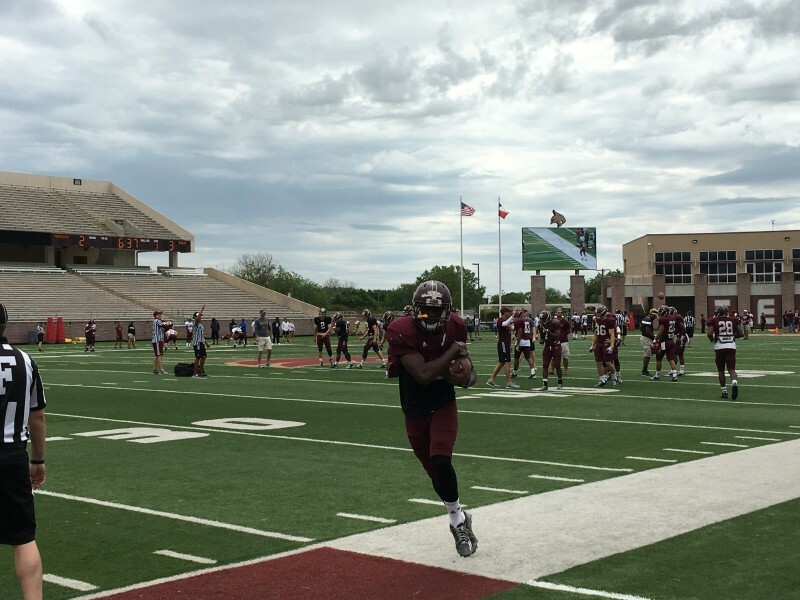 The Texas State football team took the field at Bobcat Stadium on Saturday for their annual Maroon-Gold Spring Game to showcase to the fans what the new era of Bobcat football has in store. Despite bad weather in the area, eager fans gathered in Bobcat Stadium to have their first look what the football team looks like under new head coach Everett Withers. One thing about coach Withers that separates him from the pack is the energy he brings to every practice and workout. The football team reflected that type of energy yesterday at the spring game, looking enthused and pumped up to play. The very first competition for the Bobcats was the circle drill, where players line up one-on-one and try to out power their opponent. Students came rushing towards the circle on the field in attempt to catch a glimpse of the action. Texas State students were allowed on the field if they wanted to watch the scrimmage up close. Fan interaction was great today. There was a giant moon bounce for kids to play on at the north end zone. Booths were set up for face painting and a mini train giving rides for the kids. Texas State fans are excited about this upcoming football season and coach Withers has everything to do with it. Change was needed in the program and so far, Withers is making the right moves in order for the Bobcats to become a great football team. The team has been on a grind throughout the spring with intense workouts and practices. Lets just hope all the hard work pays off next season.